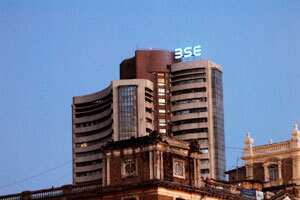 New Delhi: Shares were trading down 0.7% on Friday as investors awaited industrial output data that is expected to show weak growth due to sharp increases in interest rates and slowing spending. Tata Steel, the world’s No.7 steelmaker, fell as much as 5% to ₹ 423.15, after it posted an 89% slump in quarterly profit and warned of weak demand worsening the next few quarters. Shares in airline Kingfisher fell more than 17% after media reports said 130 of its pilots had resigned after the cash-strapped carrier cancelled over 35% of its scheduled flights on Thursday. Investors also dumped DLF, India’s largest listed real estate developer, after the company reported an 11% fall in profit for the quarter to end-September. The stock shed more than 2%. India’s industrial output growth probably slowed to an annual rate of 3.5% in September, weighed down by slower growth in infrastructure output and higher borrowing costs, a Reuters poll showed. The data is due around 11:00am. “If IIP figures are good, it will be a surprise," said Deven Choksey, managing director at KR Choksey Shares & Securities. He said moderation in corporate earnings, slowing industrial growth and sluggish policy environment have already been priced in, but a depreciating rupee that fell to its lowest level in more than two-and-a-half years was making investors nervous. The main 30-share BSE index was down 0.73% at 17,236.22 points by 10:18am, with almost two thirds of its components in the red. The benchmark, which is one of the world’s worst performers this year, fell as much as 1% in early trade and is on track to post a second straight weekly decline. ICICI Bank, State Bank of India and HDFC Bank fell on continued concerns about the health of the banking system, worsened by weak asset quality and rising bad debt. Energy major Reliance Industries, which has the biggest weightage in the benchmark index, dropped 0.5%. The broader 50-share NSE index was trading down 0.90% at 5,173.75 points. In the broader market, there were about 3 losers for every gainer with 153.3 million shares changing hands. Asian shares rebounded modestly on Friday and the euro clung to tentative gains, after brighter corporate news lifted U.S. stocks and debt-ladened Italy was able to fund itself at a bond auction. At 0420 GMT, the MSCI’s measure of Asian markets other than Japan was up 1.31%, Japan’s Nikkei was up 0.46% and South Korea’s Kospi was trading higher by 2.36%. Hindustan Construction rose more than 7% after the environment ministry gave conditional clearance to a $31 billion hillside township Lavasa, being developed by the company. Voltas fell 5.6% after its July-September net profit slumped 54.7%.